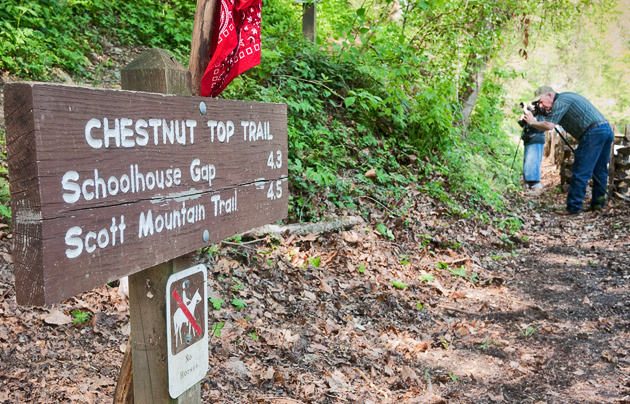 Just a hundred yards north of the Townsend Wye is a parking lot, and across the road is the start of the Chestnut Top Trail. 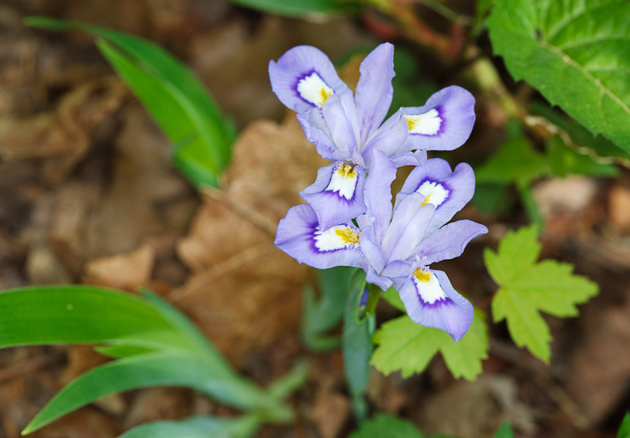 In spring this is one of the premier Smoky Mountains wildflowers hikes, with opportunities for photos every few feet! The trail cuts into a steep embankment, climbing steadily for the first half-mile or so. It is this part of the hike that is packed with a huge assortment of flowers. Hike the trail often during late March and April, and you will see plenty of Trilliums. Fire Pink, Star Chickweed, Trailing Arbutus, Crested Dwarf Iris, Squawroot, Spring Beauty, Bishops Cap, Foamflower, Stonecrop, and many more. How’s that for name-dropping? Another nice thing about Chestnut Top Trail is that the steep bank puts many of the blooms almost at eye level on the upper side of the hill, which sets them up nicely for photos. As you climb the steep hill, the Little River runs north below you, and eventually you can spot the fields of Tuckaleechee Cove. Please stop in and visit me to see the complete display of wildflowers and landscape photos of the Smoky Mountains at the William Britten Gallery in Gatlinburg, TN. And if you are a facebook user, please “Like” either of the two pages shown on the panel to the right. On the Wildflowers Community page we share photos, bloom locations, and other tips.